A call to Marcel Borgmann at Sea Independent brings more news of his latest listing, the 26.82m classic sailing yacht Nicole Maria. Mahogany built in Norway in 1930 to a design by Johan Anker, she's proved her mettle with several transatlantic crossings. The current owner bought her in 2003 and embarked on a massive resoration project. Accommodation is for 10 guests in a master, two double and four single berths while power comes from a 185hp Volvo engine. 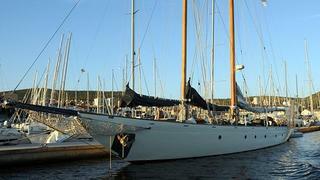 Lying in Croatia, Nicole Maria is asking €395,000.